In years of interacting with the City, CELOS researchers have noticed, particularly within the Parks, Forestry and Recreation department, that there is often a preocupation with liability and legal issues in fashioning and interpreting policy and procedures. We aren't lawyers and we are not qualified to offer legal advice or conclusions. 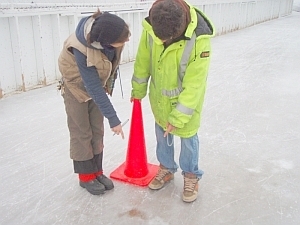 Rather, we have researched some laws and policies concerning public space as a response to issues that have arisen at Dufferin Grove and other city parks and city rinks. We want to inform ourselves about what the laws say so that our public discussions can be more fruitful. We want to share the information we have and continue to correct any errors or misunderstandings about how the laws which affect public space work. Over the last several years, laws and policies, and the ways they are understood or interpreted, have affected our parks and public spaces in a number of different ways. For example, citizens and groups carrying out innovative projects or experiments may run afoul of laws that are designed for other contexts. 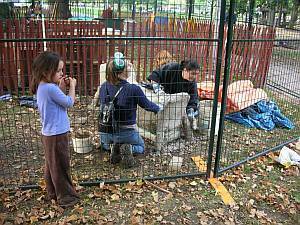 This has happened, for example, to stall the building the Dufferin Park Bio Toilet. The cob structure designed to house the toilet, is to be built by the community using cob (similar to adobe). The provincial Building Code is one of the laws which sets requirements and standards for building conventional buildings. However, it has no provisions concerning building with cob: dufferinpark.ca/cobcourtyard/wiki/wiki.php?n=CompostingToiletProject.FrontPage. What to do? Actions that seem uncomplicated from an administrative point of view, like the policy of removing half the swings on playgrounds to space them more widely, can have quite unhappy effects on park users. There is a sudden scarcity of swings. The children become anxious and argumentative, there are lineups for swings and frustration for parents, and a visit to the playground becomes a contest rather than a pleasure. CELOS discovered that there is no legal requirement to remove existing swings before there is money to replace them. We also found out, with the help of yet another piece of legislation -- the Freedom of Information and Protection of Privacy Act -- that there has never been a swing collision that resulted in an injury claim against the City of Toronto. This kind of information helps administrative staff to be more relaxed and more responsive. Swings were put back into some of the playgrounds. This may seem like a small thing, but for CELOS, and for the kids who swing, and for the parents who catch up on neighborhood news while they're pushing their kids on the swings, it was highly gratifying. ERM Guideline About the BC Government's "Enterprises Wide Risk Management Tool." Using this template, "..Planners can effectively integrate expert opinion and stakeholder views, expressed as discrete risks. Spending priorities, as well as previously hidden overspending (excessive controls) are brought to light. This helps government move away from excessive risk aversion, and towards evidence-based decisions. Positive outcomes have been demonstrated in BC and other jurisdictions." Ontario Public Service Risk management framework, February 2002. Includes a list of some case law that may be relevant to the City's obligations in parks and public space. One ice rinks case. Occupiers’ liability is the law that governs that person A may sue person B if A is injured while on B’s property. Here are some clauses in the City of Toronto Act 2006 which emphasize the importance of creative work that people do to make the City a lively, interesting place to be. The relationship of policy and law. Sword et al, Justice J.O'Driscoll A case of City teeter totters ina school playground, 1070.
www.canlii.org/en/ For searching recent cases. A Chill on The Guardian, January 15, 2009.